A continuous CO2 laser beamwas focused on a surface of hexagonal boron nitride under low nitrogen pressure, inducing a stiff radial temperature gradient, rising locally over the dissociation temperature. 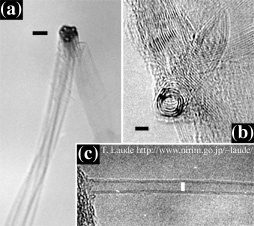 Boron nitride nanotubes and faceted boron nitride onions were found on the heated surface, segregated in specific zones. Nanotubes were grown in macroscopic quantity, stoichiometric , well crystallized, mostly with few layers and self-assembled in ropes as long as 40 microns. The cavity of boron nitride onions was often occupied by a boron nano-crystal. The recombination of boron and nitrogen both in plasma and on surface is suggested for the nucleation process. 380 k jpeg Fig. 1: (a) Growth on the heated surface. (Binocular microscope image.) The heating has resulted in segregation in four zones. I: Drops of solidified boron. II: h-BN platelets. 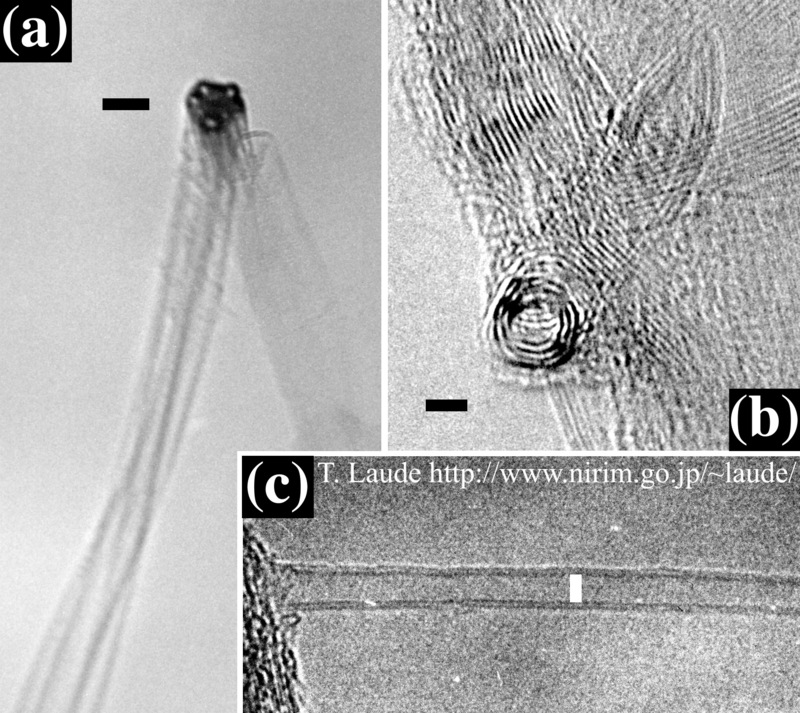 III (75 microns large ring): Thin BN nanotubes have grown self-assembled in ropes forming a crown perpendicular to the surface. The most developed part of the crown (up image) is close to a large boron drop in the hole (arrow). IV: The surface is covered by BN nano-polyhedrons. Diameter of the hole:0.55 mm. 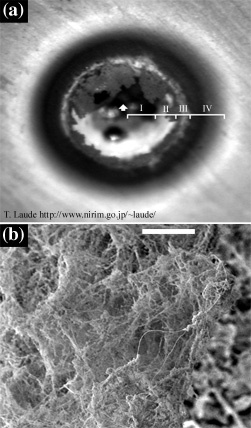 (b) SEM view of the crown-like material (corresponds to Fig. 1a, ring III, up image). Tangled BN ropes, as long as 40 microns, are mixed with BN nano-polyhedrons powders. Scale bar 10 microns. 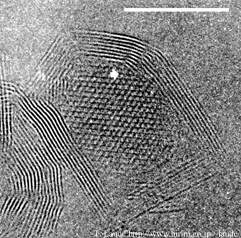 TEM imaging of BN tubes. Fig. 2: (a) Curl of a rope. A section of a rope, which is perpendicular to the electron beam, appears contrasted. It contains ~ 10 tubes. During the imaging, the rope is slightly vibrating due to the charging effect under the electron beam. Scale bar 10 nm. (b) Section image of a three-layer tube showing a circular section. Scale bar 2 nm. (c) Two-layer tube. Scale bar 2 nm. Fig. 3: On a BN rope (beam focused to the diameter of the rope ~ 40 nm), the inelastic electron energy loss is very similar to that of (stoichiometric) h-BN. For a large (50 nm) BN nano-polyhedrons containing a boron nano-crystal (20 nm probe), the N/B ration is non-stoichiometric. Spectra have been background corrected, vertically expended to an equal N-K loss and vertically shifted of an arbitrary offset. Fig. 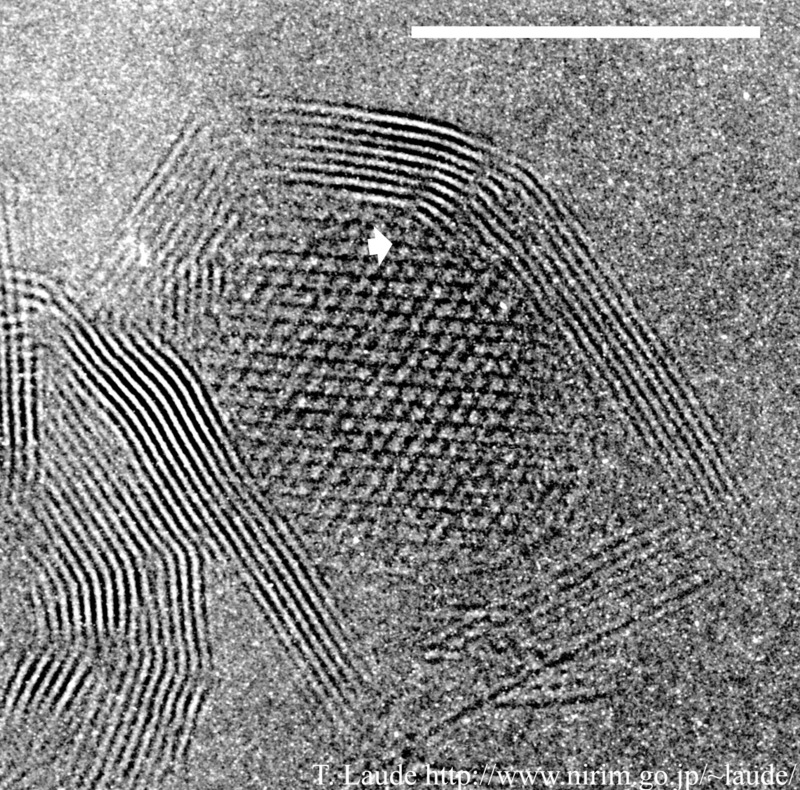 4: TEM imaging of a BN nano-polyhedron containing a boron nano-crystal (direction 0001, hexagonal indexing). New layers of BN seem to be emerging from the boron lattice (arrow) in a recombination process. Scale bar 10 nm.